Over the past few years, devastating tsunamis off the coast of the Indian Ocean have killed hundreds of thousands of people. Even more alarmingly, scientists predict that these tsunamis, as well as a series of earthquakes and volcanic eruptions, may eventually threaten Hawaii, California, and Oregon. The cause of this trinity of natural disasters is plate tectonics. Perhaps the greatest advance made in the field of earth science, the plate-tectonics theory argues that the surface of the Earth is broken into large plates, which change in size and position over time. The edges of these plates rub against each other, causing earthquakes, volcanoes, and tsunamis that continue to inflict such intense destruction to the surface our planet. 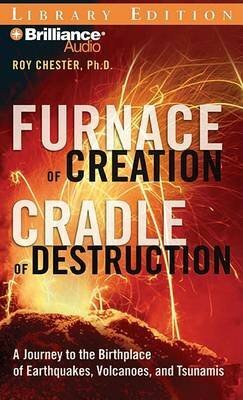 In Furnace of Creation, Cradle of Destruction, renowned scientist Roy Chester reveals the fascinating history of this discovery and tells the enigmatic story of one of the great mysteries of our time: how the surface of our planet was created and how it has evolved. From the early discoveries of Sir Francis Bacon to the beginnings of geology and the controversy surrounding the theory of continental drift, this impeccably researched book reveals the evolution of a vital scientific theory. Lucid and compelling, this book offers a long-awaited explanation of the underlying forces that shape our world.